The Larson Electronics RNT-LM-SMDE-30-8-5S-4X400LTL-LED-SMH-UD-EW-RD-E2E skid mount LED light plant provides a safe and effective way for operators to quickly deploy 1,600 watts of intense lighting to elevations up to thirty feet. The four 400 watt LED lamps produce a wide spread of intense white light, allowing this unit to effectively cover large work areas with high quality illumination. This specific skid mast is equipped with a square mast head and is specially designed for upward or downward illumination applications. The light tower folds features a rotating boom that allows for 360° of rotation, a removable square mast head for storing mounted equipment when not in use, electric winch for easy deployment, and is mounted to a cube frame with skid pockets and 4-corner pick eyes for easy transportation. Each assembly is equipped with 150` of 10/4 SOOW cable and up to three units can be daisy chained together on 240V. The RNT-LM-SMDE-30-8-5S-4X400LTL-LED-SMH-UD-EW-RD-E2E five stage telescoping steel light mast with electric winch from Larson Electronics’ is designed to quickly and safely deploy 1,600 watts of intense LED lighting in locations where elevated illumination is needed for maximum area coverage. This light boom can be extended to 30` for maximum area coverage and collapsed to 8.83` for applications where a footprint smaller is required. 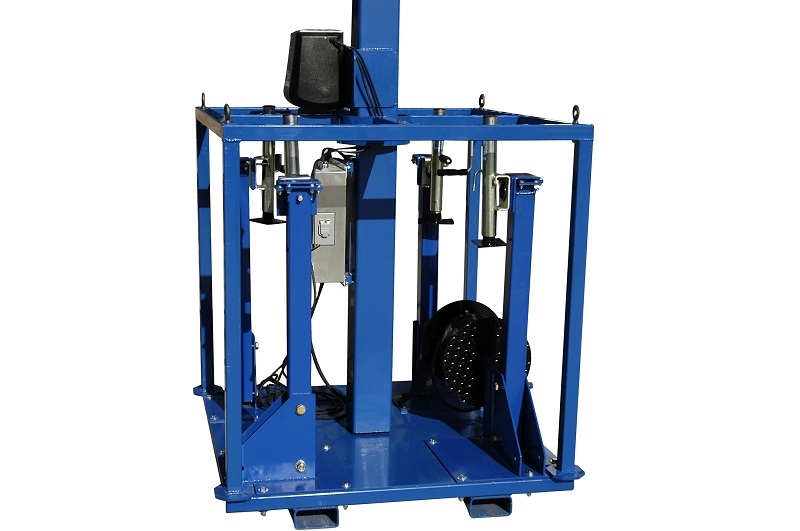 The tower is constructed of square steel tubing with a base section 5.92` in length and 6" by 6" by 3/16" thick, lower section 6.04` in length and 5" by 5" by 3/16" thick, middle section 6.19` in length and 4" by 4" by 1/8" thick, upper section 6.34` in length and 3" by 3" by 1/8" thick, and an top section 6.5` in length and 2" by 2" by 1/8" thick. Each section has a 1` overlap. The mast is elevated using an included 2,500 lbs electric winch with 3/16" galvanized steel cable. Included with this light tower is four of our wet area suitable GAU-LTL-400W-LED high output LED fixtures producing a combined total of approximately 216,000 lumens at 1,600 watts. The light head contains forty-eight Cree® high output LEDs producing 1125 lumens each are arranged in rows and paired with PMMA high purity optics to produce a well focused 24° wide spot beam that is ideal for providing far reaching concentrated illumination while still covering a substantial amount of area. We also offer optional optics with 10° spot, 38° narrow flood, 60° flood, and 90° wide flood beam spreads. The spot beams are tightly focused and are designed for high elevation mounting to achieve distance, making spot versions ideal for high mast and spots lighting. The flood beams are designed to provide more light over a larger area nearer the fixture, making flood versions ideal for use as dedicated work and area lights. Each floodlight is securely fastened to the light boom and each lamp includes a stainless steel support bracket to help maintain lamp stability within its housing. The lamps are hard wired into a NEMA 3R panel located on the end of the telescoping boom. Durability: As well as unparalleled heat control, the GAU-HB-400W-LED-SS series of LED lights from Larson Electronics also offer IP67 rated construction that is designed to withstand extremes of environmental and operating conditions. These units can withstand rapid temperature changes of -40° Celsius to +80° Celsius, are waterproof, and resist ingress of dust, dirt and humidity. The housings are formed from die cast aluminum and the optics are high transmission PMMA with 98% light transmittance. The Cree® LEDs help these units achieve resistance to vibrations and are rated at 70% lumen maintenance after 80,0000 hours of use. We use these LED lights for applications where a lot of vibration, dust, dirt, dampness and abusive working conditions are encountered. The towers and assembly is powder coated with glossy blue finish for corrosion resistances and aesthetics. The mast and controls are secured within a cube-style frame constructed of 2" by 2" by 1/8" thick and measuring 48" wide by 48" long by 53" tall. Four 4` slide out outriggers with 1,200 lbs manual crank leveling jacks allow operators to anchor the unit down, providing stability during deployment. Four skid pockets allow this unit to be picked up from all four sides, and four-corner pick eyelets allow for stable deployment via crane operation. Mast Head: The RNT-LM-SMDE-30-8-5S-4X400LTL-LED-SMH-UD-EW-RD-E2E features a unique square mast head design. This square mast head design allows operators to position the lights in the vertical position, for upwards or downwards illumination. With the T-style mast head equipped on our standard light masts, the bottom light heads will block the light output of the top light heads when aimed straight downwards, and the top light heads will block the light output of the bottom light heads when aimed straight upwards. With the square mast head, the light heads are positioned in a square, so each light head can be aimed upwards or downwards without interfering with the other light head. The LM family of telescoping towers feature a proprietary mast guidance system, which provide increased stability during high winds. This light plant system can withstand winds up to 125+ mph when lowered to 8`, and up to 55 mph when fully extended. When elevated to its full upright position,the mast can be rotated a full 360°. By loosening the T-Handle, operators can rotate the mast with easy in either direction. The mast can be positioned in one of four different directions, and locked back in place by re-tightening the T-handle. The mast itself spins freely with easy, and can typically be rotated with a single hand. The mast is operated via centrally located control box with power switches within the cube frame, allowing operators to power the LED light fixtures on or off. Wiring is provided via 150` 10/4 SOOW cable terminated in a 30 amp L14-30P twist lock plug. 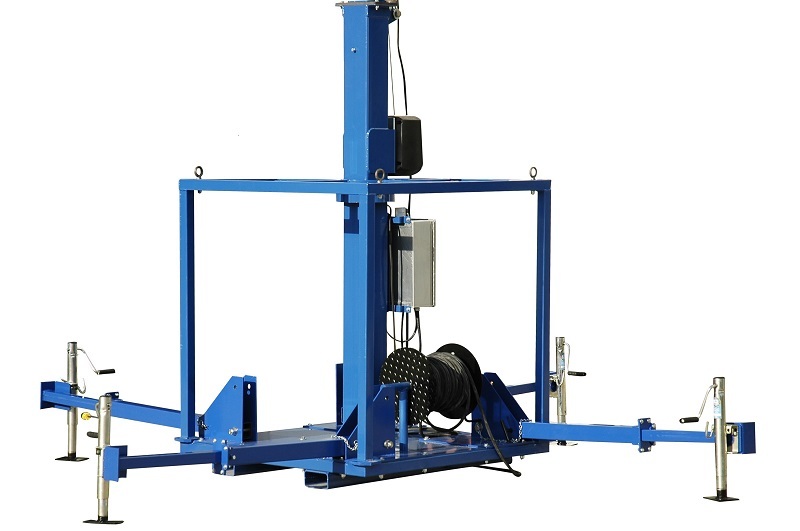 A manual roll up drum mounted within the steel cage frame provides storage for the power cable. A waterproof L14-30C twist lock connector allows up to three units be daisy chained together on 120V circuit or up to three units on a 240V circuit. All electrical components are UL/cUL listed. Larson Electronics can custom tailor these units to the customer’s requirements with longer sections and larger mounting plates. For example, the LM-25 is another model that reaches to a length of 25 feet, with a 15 foot lower section and a 10 foot upper section and a 4 foot wide upper mounting bracket. We also offer a choice of either the manual 1,000 lbs hand winches included standard or optional electric winches. Suggested Applications: Temporary lighting, construction sites, and security camera deployment. We can equip this mast with 1000W or 1500W Metal Halide lights or a wide variety of high powered LED lights with comparable power, including the GAU-LTL-400W-LED, LED10WSA-160, LEDLB-200X2E, LEDLB-160X2E or LEDLB-80X2E.